In the early morning hours of Wednesday October 8th, you can kick your day off watching a total lunar eclipse if the weather cooperates. If the Greater Binghamton Area has clear skies, starting at around 4:30 AM and running up until around 7:30 AM EDT, you can watch nearly a full cycle of a lunar eclipse, including a one hour period of totality. Keep an eye on this site for any local information about observing the eclipse. Penumbra first visible: 4:45 a.m. Partial eclipse begins: 5:15 a.m.
Total eclipse begins: 6:25 a.m.
Total eclipse ends: 7:24 a.m.
Visit Sky & Telescope Magazine’s October 2014 Lunar Eclipse article for more detailed information on observing the eclipse, including the image shown below. 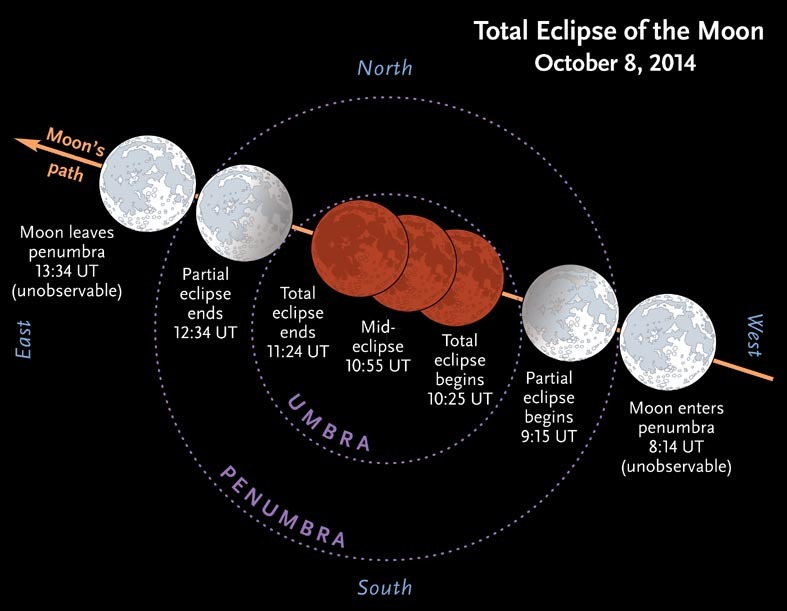 This Sky & Telescope timeline shows the times and phases of the October 8th Lunar Eclipse.